One of the children's favourite books in our classroom is We are going on a Bear Hunt. They love the chanting rhyming tone of the text, the pictures, the repetitive and therefore predictive actions.. So we often use this story to introduce our topic on bear and hibernation. 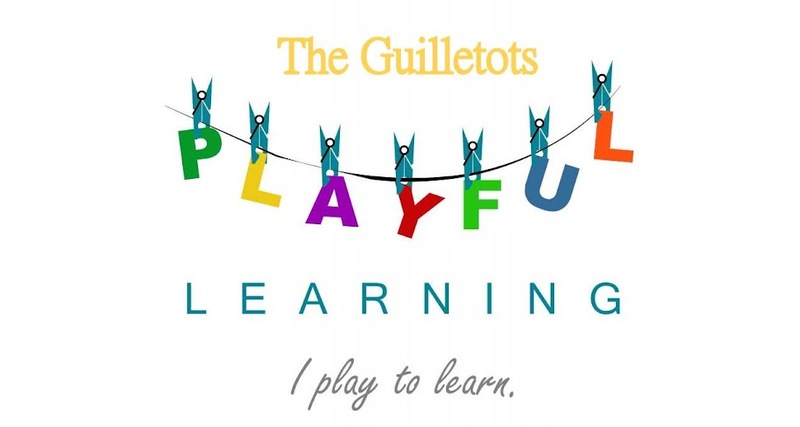 Here are a few examples of our classroom's activities based around the book. 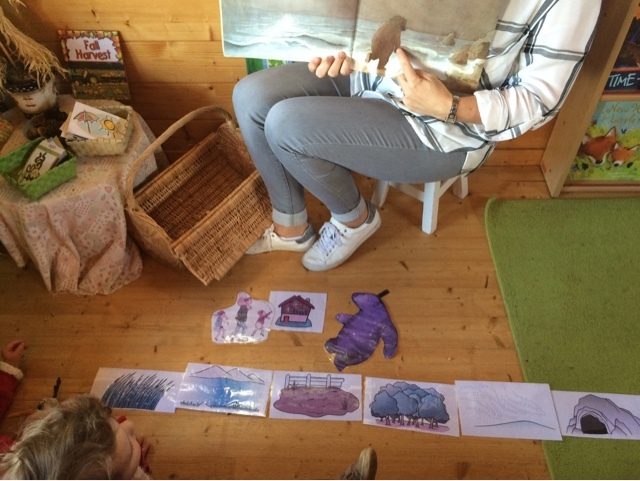 At circle time, once the children were familiar to the story, we introduced the props to add another twist to the story telling experience. 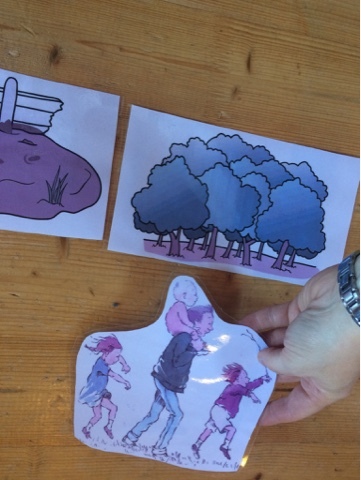 This activity aimed to help the children further explore the use of descriptive language (adjectives) in the story. I needed an activity which could bring their interest to life. 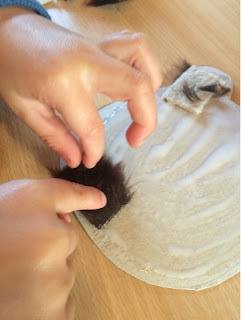 As the children LOVE painting, I thought about this simple craft: it helps the children to sequence the story but also to describe what they see on each page with specific descriptive words: long wavy grass, oozy thick mud etc.. I stuck a black paper cave in the middle of a large paper sheet and divided the sheet into 5 sections with a pencil. As we read through the book during the activity, I asked the children if they could find other words than "long" and "wavy" to talk about the grass for example. They came up with "green", "dark green" and "tickling". So I encouraged them to paint in the first corner of the page to represent the grass. The river was deep and cold but the children thought it was also "wet", "wavy" and "blue". Then I asked them to talk about the mud: its thick and oozy but it's also "brown", "dirty" , "brown" and "sticky". 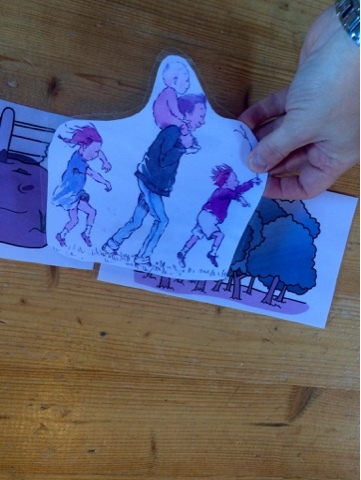 The children had to think a bit harder to describe the forest: they finally said forests can be "green", "brown", "dangerous" and "scary" (especially if you get lost apparently and they are sure that if the dog wasn't there to show the way, the family would have got lost!). The snowstorm was swirling and whirling but it was also "cold", "freezing" and "white". The children painted a segment of the sheet after each description. They all took turn, two at a time. 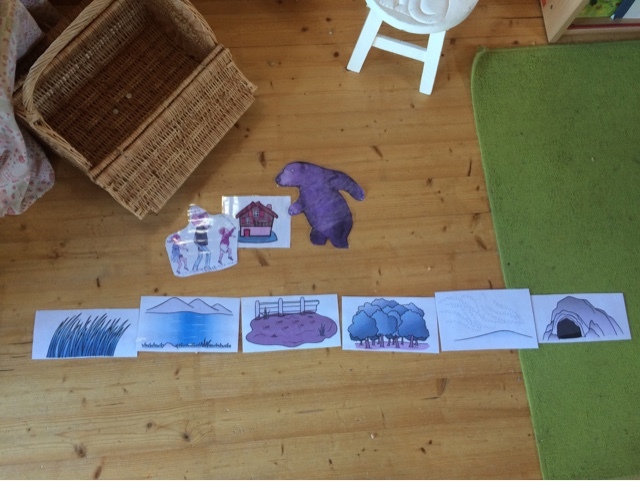 Once the children were familiar with the story, we asked them where they thought real bears lived. This was our introduction to our science bit. 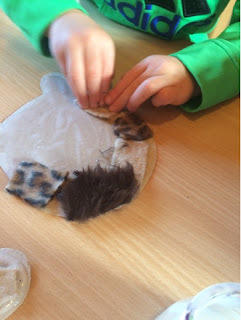 The children were well able to differentiate real bears from fantasy bears and understood that bears do not live in houses, wear clothes or eat food at the table. But they were not sure where they lived. So we used a book I created a few years ago. 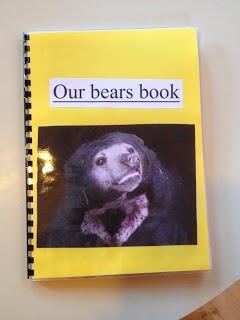 I had printed several pictures of different types of bears, laminated each page and bound together to make a book. 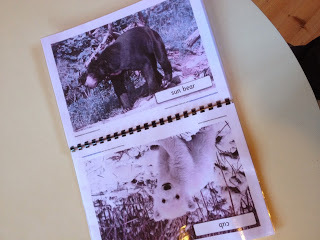 The book shows them the body parts of a bear, shows them the difference between sloth bears, sun bears, brown bears, grizzly bears, black bears, polar bears... and teddy bears! It also shows shoes them where they live what they eat and introduces them to the concept of hibernation. Bear collage using cardboard from cereal box as template and brown felt fabric for the collage. Berry picking and cupcake baking!